ABOARD THE CHICHAGOF DREAM —As usual, we received a cheerful wake-up greeting from our expedition leader, Maggie. In fact, she provides fact-filled cheery announcements throughout the day. Today we took a journey through the entire length of Tracy Arm which extends over 32 miles. 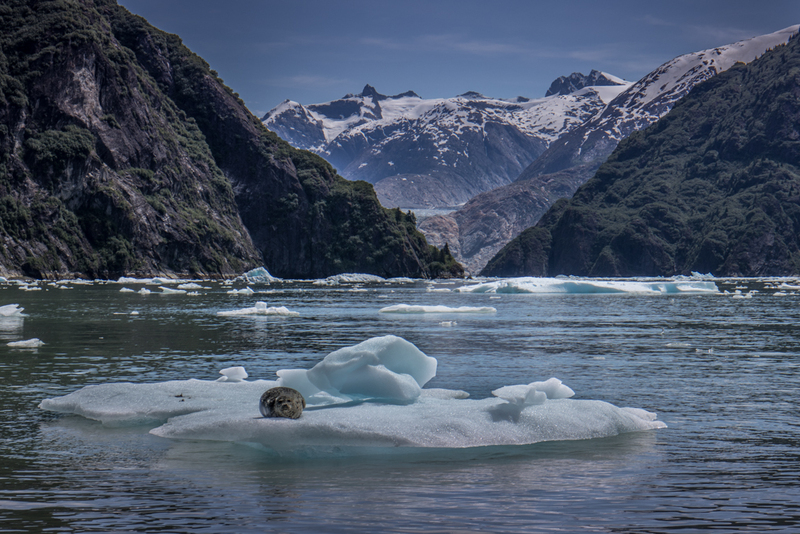 Tracy Arm is a glacial fjord with stunning waterfalls, icebergs, and towering cliffs that rise high above the river valley. According to the “A Look Ahead” information sheet provided with our daily itinerary at turndown, the glaciers of this region branch off the 500 square-mile Stikine Icefield, where snowfall often exceeds 100 feet per year. As snow builds in this accumulation zone, the resulting ice begins to overflow into the valleys, forming glaciers. The information provided includes the area’s history and has been curated by Alaskans with many years of local knowledge. What differentiates Alaskan Dream Cruises from other cruise companies is that it is a family owned business. The company was founded by Bob Allen who grew up in Nenana, Alaska. Bob’s wife Betty, of Tlingit and Russian ancestry, grew up in Juneau. 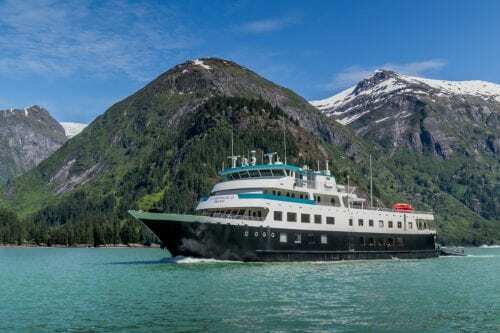 The Allens’ story is not only about the fruits of hard work and savvy entrepreneurship during the growth of the Alaskan tour industry, it’s a representation of the Great American Dream and a lasting desire to share with others Alaska’s beauty. 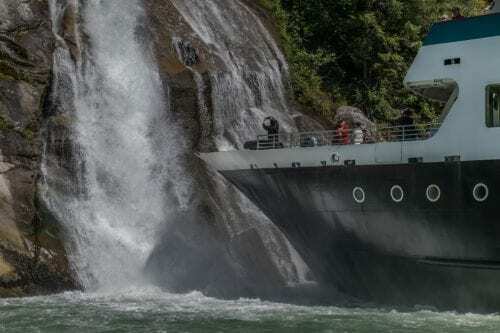 Today, Alaskan Dream Cruises is one of the most successful tour businesses in Alaska. Chichagof Dream at the “Hole in the Wall” in Tracy Arm. Today we learned how to properly classify the floating ice in Tracy Arm. A chunk of ice must be at least 35 feet in any dimension to be classified as an iceberg. Chunks between 16-35 feet are called growlers. Chunks smaller than16 feet are called “bergy bits”. Passengers marveled at the deep turquoise blue icebergs passing by dining room windows. We came around a bend and saw a beautiful cascading waterfall ahead. After anchoring, we boarded an inflatable boat to take a closer look at the face of the glacier. 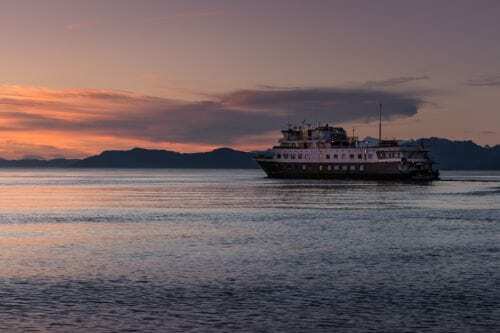 During each of these excursions, our guides provide in-depth information about what we were seeing – and there is certainly no shortage of interesting facts. A little while later, we boarded an inflatable to take a close look at a stunning deep blue iceberg that glistened in the sunshine. 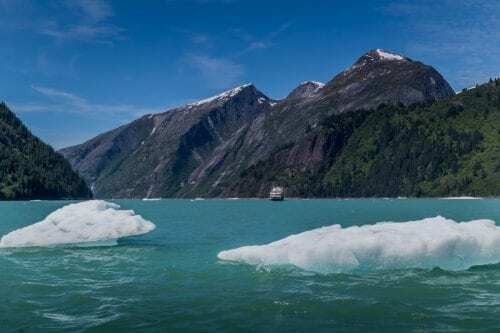 Along its surface, the ice melted and trickled slowly into the water below There’s no better way to show readers how good the weather can be here in the summer in Southeast Alaska than to show a melting icebergs! Five Finger Lighthouse, as seen as the Chichagof Dream sails by. Chichagof Dream between Stephen’s Passage and Frederick Sound at sunset. In the evening, we spotted a pod of Dall’s porpoise swimming alongside the boat and two whale flukes off the bow. 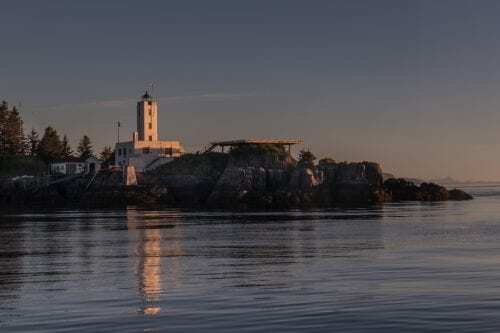 Later that evening, we took photographs in front of Five Finger Lighthouse which is situated on a small island that lies between Stephen’s Passage and Frederick Sound. Opening in 1902, it is one of the first U.S. government lighthouses. Tonight’s sunset was spectacular. The light from the setting sun shined on the starboard side of the vessel like shimmering gold. At twilight, the colors in the sky became nature’s canvas, filling the vast expanse all around us with hues of blue and fiery orange. Another truly unforgettable day spent enjoying Alaska’s beauty.